We want to start off this blog post with an announcement. This week our vet hospital had a bittersweet celebration for our kennel attendant Claire, as she is retiring after 26 years of hard work at ERABH! 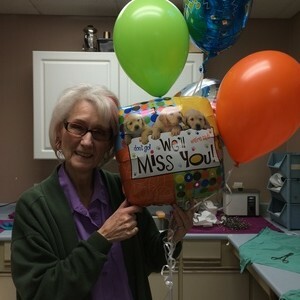 We will miss her very much and wish her a stress-free retirement filled with many years of fun and happiness! On Tuesday, we treated a cat named Lionel for tooth resorption. This is a common and painful disease in cats, and we do not yet know what causes it! Tooth resorption is a progressive disease that results in the destruction and loss of the tooth. They tend to occur just at or below the gum line, and are diagnosed with a combination of visual, tactile and radiographic means. Some times the tooth may look completely healthy from the outside, but once dental x-rays are taken, a lesion below the gum line is found. 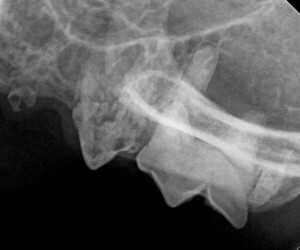 This is one reason why dental x-rays are so important and an essential part of a complete and thorough dental procedure. If a lesion is found, that tooth is extracted. Lionel’s tooth resorption issues started 4 years ago. On Wednesday, Teddi visited our vet clinic for a recheck on a surgery we performed 2 weeks ago. 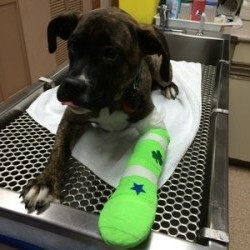 Teddi is a 5 month old puppy that fell 7 feet on to cement and broke her femur very close to her hip joint. Ouch! 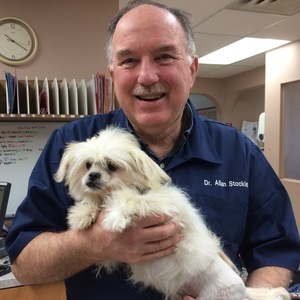 Dr. Stockley performed what is called a femoral head osteotomy, meaning he removed Teddi’s “ball” of the ball-and-socket that makes up the hip joint. The surrounding muscle and developing scar tissue work together to create a floating or false joint. This procedure is also used on dogs with severe hip dysplasia or osteoarthritis. Most dogs return to normal activity only a couple weeks after the procedure, and Teddi was no exception to this! It was quite amazing to see her walking around like nothing had ever happened. Watch the video below to see for yourself. Speaking of broken bones, that same day we also saw another adorable puppy named Dexter who had tripped over something at home and was now not weight bearing on his right front leg. X-rays showed that he had broken his radius. Luckily for him it’s an uncomplicated fracture and will not require any surgical intervention, just a splint for 6-8 weeks. We wish Dexter a very speedy recovery! 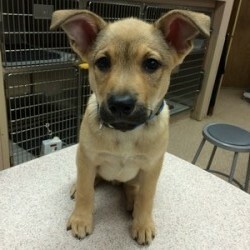 Our last patient of 2015 was Tank, an adorable 8 week old puppy who visited Dr. Hardin for his second set of vaccines. We look forward to seeing those floppy ears again in a month’s time for his third and final set of puppy vaccines. We hope 2016 is treating you and your pets well. Thank you for reading! Until next week!